Doug Ford, brother of fallen crack-smoker/Toronto mayor Rob Ford, sure has a lot to say about drugs and politicians. 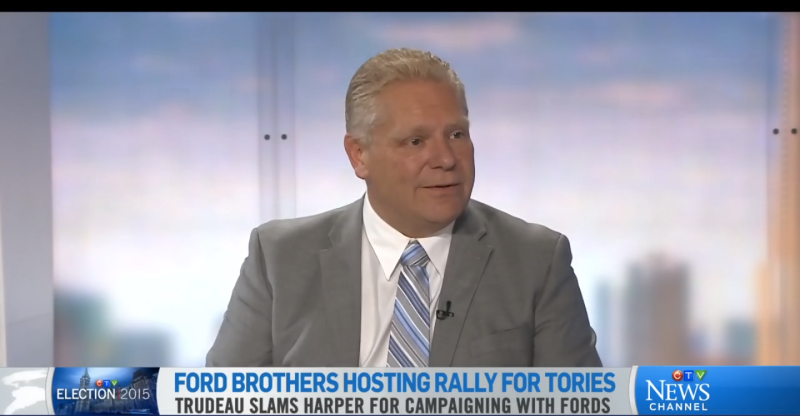 During an interview with Canada’s CTV this week, Ford, also a conservative Toronto politician, was asked about whether he’s “tough on crime.” Ford used the opportunity to comment on the drug use of Justin Trudeau, leader of Canada’s Liberal Party. Ironically, Ford also asked viewers to take “sober second thought” about voting for Trudeau, who’s currently campaigning in the general election. Ford and his better-known brother, it’s well known, are no strangers to rumors of drug use. According to The Globe and Mail, an investigation found that Doug Ford himself was accused of selling hashish in the 1980s for several years. Perhaps it was a momentarily slip, and he forgot that his brother left office last year after admitting he’d smoked crack cocaine. Perhaps he’d also forgot that crack cocaine wasn’t the only thing Rob Ford smokes. This post has been updated to include details of accusations that Doug Ford had sold hashish in the 1980s.